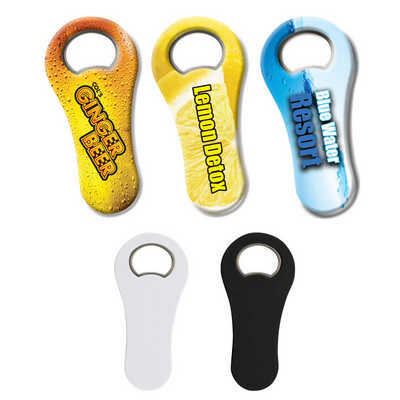 Sturdy ABS plastic bottle opener with nickel plated steel opener and magnet on back for attaching to fridge. Colours - Black, Dark Blue, Light Blue, Light Green, Orange, Red, White, Yellow Size - 105 x 50 x 4mm (LxHxD) Decoration Area(s) - Pad Print : 50 x 25mm (LxH); 4CP Digital Direct Print : Full coverage - all over print - refer line drawing. Price includes : 1 Col 1 Pos Print - WT. Setup is included.